The University of Illinois at Urbana-Champaign is the oldest and largest campus in the University of Illinois system. The university, then called the Illinois Industrial University, opened for classes on March 2, 1868, as a result of the 1862 Morrill Act. The name was officially changed to the University of Illinois in 1885, to reflect the broader scope of class offerings. 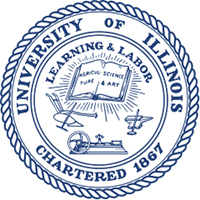 The name of the Urbana location within the larger University of Illinois system was changed again in 1982, to The University of Illinois at Urbana-Champaign. The university department of physics is ranked among the top ten programs in the nation, and is the site of the Department of Energy's Center for the Simulation of Advanced Rockets, programs in materials science and condensed matter physics research, the Frederick Seitz Materials Research Laboratory, the Micro and Nanotechnology Laboratory, and a national historic landmark astronomical observatory. 1870Stillman Robinson introduces the first course in physics, Champaign (Ill.). 1875Laboratory practice is included in the physics curriculum. 1889The Department of Physics is created as part of the College of Engineering. 1901The Department of Physics establishes a graduate degree program. 1909The Physics Laboratory is completed and the Department moves into their new home. 1910First two Physics PhDs are awarded. 1922E. Frances Seiler becomes the first woman to earn a PhD in Physics from the Department. 1929 – 1976F. Wheeler Loomis was on faculty. 1930 – 1977Gerald Almy was on faculty. 1936P. Gerald Kruger and his students build the world's third cyclotron. It is the first outside of Berkeley, California and the first to have an external beam. 1938 – 1945Robert Serber was on faculty. 1938 – 1947Leland Haworth was on faculty. 1938 – 1950Maurice Goldhaber was on faculty. 1938 – 1957Donald Kerst was on faculty. 1939 – 1950Gertrude Goldhaber was on faculty. 1940 – 1942Norman Ramsey was on faculty. 1941 – 1942Philip Morrison was on faculty. 1944Plans are made to build a 250-MeV betatron. 1946 – 1950Gerald Tape was on faculty. 1949The Digital Computer Laboratory (DCL) is created and tasked with building the University's first computer system. 1949 – 1950Sidney Drell was on faculty. 1949 – 1965Frederick Seitz was on faculty. 1949 – presentDavid Lazarus has been on faculty. 1949 – presentCharles Slichter has been on faculty. 1950Erwin Hahn was on faculty. 1950 – 1957Geoffrey Chew was on faculty. 1951The Control Systems Laboratory (CSL) is created and focuses on radar and possible uses of new digital computers. 1951 – 1953Albert Overhauser was on faculty. 1951 – 1991John Bardeen was on faculty. 1952 – 1955David Pines was on faculty. 1952 – 1956Francis Low was on faculty. 1952 – 1966John Wheatley wa son faculty. 1952 – 1992Hans Frauenfelder was on faculty. 1953 – 1956Elihu Abrahams was on faculty. 1955 – 1957Leon Cooper was on faculty. 1957 – 1958Elliott Lieb was on faculty. 1957 – 1960Robert Novick was on faculty. 1957 – 1967J. David Jackson was on faculty. 1957 – presentRalph Simmons has been on faculty. 1959A new physics building is completed. 1959 – 1962J. Robert Schrieffer was on faculty. 1959 – 2007Donald Ginsberg was on faculty. 1961 – 2015Ansel Anderson was on faculty. 1962 – 1969Leo Kadanoff was on faculty. 1962 – presentMiles Klein has been on faculty. 1963 – presentGordon Baym has been on faculty. 1964 – 1967Anthony Leggett was on faculty. 1967 – 2016Jeremiah Sullivan was on faculty. 1969 – 1970Walter Massey was on faculty. 1969 – 1971Peter Feibelman was on faculty. 1969 – 1972Charles Duke was on faculty. 1970Lorella M. Jones becomes the first woman to receive tenure in the department. 1970 – 1972David Campbell was on faculty. 1972 – 1984William L. McMillan was on faculty. 1972 – 2006Vijay Pandharipande was on faculty. 1980The Physics Building is renamed the Loomis Laboratory of Physics. 1981 – presentDale Van Harlingen has been on faculty. 1982John D. and Catherine T. MacArthur Foundation established an endowed chair. 1983 – 2002Harry Drickamer was on faculty. 1983 – presentAnthony Leggett has been on faculty. 1985 – presentNibel Goldenfeld has been on faculty. 1987 – presentDavid Ceperley has been on faculty. 1989Sony Corporation gives gift to establish the John Bardeen Endowed Chair. 1990Centennial anniversary of the department. 1992 – presentLaura Greene has been on faculty. 1992 – presentDavid Campbell has been on faculty. 1993The Materials Research Laboratory is renamed in honor of Frederick Seitz. 1994 – 2000Roy Holt was on faculty. 1998Physics Advisory Board is created to provide advice and counsel on strategic issues for the department. 2007The Institute for Condensed Matter Theory is established. Historical information from the University of Illinois at Urbana-Champaign Department of Physics's history website (http://physics.illinois.edu/history/). Research Associate and Assistant Professor. Instructor in Physics; Associate in Physics; Assistant Professor of Physics; Associate Professor of Physics; Professor of Physics; Emeritus Professor of Physics; Acting Head, Department of Physics; Associate Head, Department of Physics; and Head, Department of Physics. Received PhD in Physics in 1961; Research Associate; Assistant Professor to Professor of Physics; Head, Department of Physics; and Emeritus Professor of Physics. Assistant Professor of Physics; Associate Professor of Physics; Professor of Physics; and Professor of Physics, Center for Advanced Study. Assistant Professor of Physics; Associate Professor of Physics; and Professor of Physics. Obtained MA, PhD in 1949 (Physics), and Research Associate. Professor of Physics and Professor Emeritus of Physics. Research Assistant Professor of Physics. Assistant Professor of Physics; Associate Professor of Physics; Professor of Physics; Member, Center for Advanced Study; Emeritus Professor of Physics, Chemistry, and Biophysics. Research Associate; Associate Professor; Professor of Physics; and Emeritus Professor of Physics. Assistant Professor of Physics; Associate Professor of Physics; Professor of Physics; Swanlund Professor of Physics; Leader, Biocomplexity Theme, Institute for Genomic Biology. Research Physicist and Special Research Assistant Professor of Physics. Professor of Physics and Swandlund Professor of Physics. Received MS in 1947 and PhD in 1949. Research Associate. Professor of Physics; Director and Co-Director, Nuclear Physics Laboratory; and Adjunct Professor. First woman to receive tenure in the the department. Assistant Professor to Professor of Physics; Director, Science and Technology Center for Superconductivity; Professor of Physics, Center for Advanced Study; and Professor of Physics Emeritus, Center for Advanced Study. Along with his students build the world's third cyclotron. Instructor; Assistant Professor; Associate Professor; Professor; and Professor Emeritus. Research Associate and John D. and Catherine T. MacArthur Professor of Physics. Professor of Physics; Head of Department; Director, Control Systems Laboratory; and Emeritus Professor of Physics. Received PhD in 1964. Professor of Physics. Research Associate; Assistant Professor of Physics; Associate Professor of Physics; and Professor of Physics. Research Assistant Professor; Professor of Physics; Research Professor of Physics; and Professor Emeritus of Physics. Received MS (1954) and PhD (1957); and Assistant Professor to Associate Professor. Research Professor of Physics; Head, Department of Physics; Dean, Graduate College and Vice President, Research; Director, Control Systems Laboratory; and Technical Director, Control Systems Laboratory. Assistant Professor and Associate Professor. Received PhD (1957). Research Associate; Assistant Professor to Associate Professor; Professor of Physics; Department Chair; and Emeritus Professor of Physics. Instructor; Assistant Professor; Associate Professor; Professor of Physics; and Professor Emeritus of Physics. Acting Assistant Professor of Physics; Assistant Professor of Physics; Associate Professor of Physics; Assistant Professor to Associate Professor, Loomis Laboratory of Physics; Professor of Physics; Department Head; and Emeritus Professor of Physics. Received MS in 1970 and PhD in 1975. Received AM in 1949 and PhD in 1952. Received BS, MS, and PhD (Physics) in 1969. Received AM and PhD (Physics) in 1932. Received MS and PhD (Physics) in 1936. Received MS and PhD (Physics) in 1957. Received PhD (1970) and Visitor. Received MS (1974) and PhD in Physics (1978). Established and endowed chair position at the department. Participated the the study of multi-institutional collaborations. Frontiers in Condensed Matter Physics symposium [sound recording], 1976. Highlights in the History of the Physics Department in the University of Illinois (1868-1968), 1967. New horizons in physics: a celebration on the occasion of John Bardeen's 80th birthday [sound recording], 1988. Pages from catalog listing faculty of Physics Department, 1946-1947. University of Illinois at Urbana-Champaign Bardeen Quadrangle dedication ceremony [videorecording], 2004 October 14. University of Illinois at Urbana-Champaign Department of Physics Betatron Project correspondence, 1938-1970. University of Illinois at Urbana-Champaign Department of Physics Betatron Project records, 1941-1945. University of Illinois at Urbana-Champaign Department of Physics centennial history file, 1990-1991. University of Illinois at Urbana-Champaign Department of Physics course notebooks, 1935-1946. University of Illinois at Urbana-Champaign Department of Physics CSX-1 computer subject file, 1961-1981. University of Illinois at Urbana-Champaign Department of Physics laboratory research publications, 1912-1927. University of Illinois at Urbana-Champaign Department of Physics records, 1907-1992. Charles B. Duke career highlights [autobiographical materials], 1959-2006. Color Centers in Alkali Halides Symposium records, 1965 October 11-13. Donald M. Ginsberg papers, 1959-1997. F. W. Loomis papers, 1920-1976. Frederick Seitz biographical notes for London meeting, 1979. Harry G. Drickamer response to History of Geophysics Survey, 1997. John David Jackson papers, 1949-2000. Kenneth O. Emery response to History of Geophysics Survey, 1997. Leo S. Lavatelli papers, 1940-1978. Oral history interview with Albert Warner Overhauser, 1982 February 22. Oral history interview with Charles B. Duke, 2007 January 23. Oral history interview with Charles P. Slichter, 1977 April 29. Oral history interview with Charles Pence Slichter, 1982 January 29. Oral history interview with Charles Slichter, 2005 March 26. Oral history interview with Donald F. Geesaman, 2013 July 15. Oral history interview with Ernest Lyman, 1982 November 18. Oral history interview with Erwin Louis Hahn, 1986 August 21. Oral history interview with Fausto Gherardo Fumi, 1982 November 27. Oral history interview with Frank Oppenheimer, 1973 February 9 and May 21. Oral history interview with Frederick Seitz, 1982 October 6 and 7. Oral history interview with George Carruthers, 1992 August 18. Oral history interview with Gianfranco Chiarotti, 1983 January 20. Oral history interview with Giuseppe Bassani, 1982 December 9. Oral history interview with John Coltman, 2004 June 30. Oral history interview with Murray Gell-Mann, 1997 July 17 and 18. Oral history interview with Norman Ramsey, 1978 December 19, 1979 January 5 and 18. Oral history interview with Philip Morrison, 2003 February 22 and August 1. Oral history interview with R. J. Holt, 2013 July 16. Oral history interview with Robert Dickson Hill, 2000 July 3. Oral history interview with Robert Joseph Maurer, 1981 March 10 and 15. Oral history interview with Robert Willis Hellwarth, 1985 May 28. Oral history interview with Sidney D. Drell, 1986 July 1. Oral history interview with Tihiro Ohkawa, 2006 May 23. Oral history interview with Walter Dale Compton, 1982 April 20. Oral history interviews. High-Energy Physics. Selected Experiments: BNL-E-776: Neutrino Oscillation Experiment, 1989. Oral history interviews. High-Energy Physics. Selected Experiments: FNAL-E-398: A Further Study of Muon Nucleon Inelastic Scattering at Fermilab, 1990-1991. Oral history interviews. High-Energy Physics. Selected Experiments: IMB: The Irvine-Michigan-Brookhaven Experiment, 1990-1991. Oral history interviews. High-Energy Physics. Selected Experiments: SLAC-SP-032: MARK-III at SPEAR, 1990-1991. Oral history interviews. Materials science: NSF Science and Technology Center for Superconductivity (STCS), 1996-1997. Robert D. Sard scientific memoirs (1946-1972), 1993. Student notes from Kunz's lectures on electron theory given at the University of Illinois, circa 1913. Theodore Welton memories, circa 1984. Wendell Hinkle Furry papers, circa 1927-1985. A collection of Professor John Bardeen's publications on semiconductors and superconductivity. Scientific and technological documentation; archival evaluation and processing of university records relating to science and technology / by Maynard J. Brichford. The Loomis legacy / by David Lazarus.